For some reason we do not have pictures of all bands on ProgFarm, please share yours! Mike Eldon’s review of Progfarm ’99 on the Allthingsprog mailinglist. The third ProgFarm Festival took place this weekend in Holland & what a great event this was, even more so than last year. This festival looks like becoming the major festival on the european scene. The event is organized by the Dutch band Flamborough Head & they are very lucky, as Koen the drummer owns the venue, which was once a farm, hence the name of the festival. During the year the site is used as a campsite & is also used for school field trips, hence the accommodation & facilities are already on site. Thus once a year prog fans can travel to the remote north of Holland & feel quite at home with around 150 “friends” with similar tastes, without being treated as outcasts!. This event should be re-named the friendly festival as everyone goes out of their way to talk…thankfully in english to us! The bands wander around chatting & complete strangers will come up & talk…Cor & Anja even invited us to stay over next time we come to Holland for a gig. This year my companions consisted Keith Marshall & Tim Burness, veterans from 1998, plus Keith’s friend Steve. We set off on Friday morning, as we learnt from our long drive overnight last year. Arriving in Calais in the afternoon we grabbed some beers (& my £5 bottle of Rum) & made the long six hour trip to Bakkeveen, arriving around 23:00, just in time to continue in the conversations of those already present on the Friday night. It was around 2:30 when we decided we better get some sleep for the next day & we were certainly looking forward to the forthcoming events. Breakfast consisted of bread, mega thin slices of Edam & chocolate sprinkles called Hagelslag….I’ve waited a full year to savour this meal again…ah I could live in Holland permanently! Midday, everyone started arriving & by 15:00 it was time to begin the 1999 ProgFarm. As in previous years, we were treated to a wide spectrum of bands from the prog scene – new 90’s bands & very very old bands from the seventies. We had a tribute band, several traditional prog bands, a neo-prog group & a fine symphonic group in the owners of the event. Never a dull moment was guaranteed….& if you found such a moment then there was a wide choice of record stalls to keep you busy Opening the proceedings this year were the Dutch band Lady Lake. The band were formed in 1973 & are an instrumental three piece, producing a complex sound not too dissimilar to early Camel & other jazz rock outfits. The band named themselves after the Gnidrolog album Lady Lake. A few months back Lady Lake had the biggest shock of their lives, when Stewart & Colin Goldring of Gnidrolog went backstage & introduced themselves. Since then both bands have become friends & for the encore Stewart & Colin join Lady Lake for their anthem I Could Never Be A Soldier. It was very emotional for all involved & a great way to start ProgFarm’99 Next was the band I would have thought were going to be playing much later in the day. I was really looking forward to seeing the Swedish band Sinkadus & it really felt like we were waiting for the headline act as the excitement built up before they arrived on stage. They did not disappoint & by the end of their set I could fill the tears building up inside! I had never experienced such emotions before & it was an honour to be here! I don’t know how Sweden produces so many fine bands but they certainly do & I’m sure my top ten bands are all Swedish. The music is dark, moody & long, sometimes it can be complex sometimes soft & heavenly. The singing in Swedish only adds to the atmosphere. I believe they are coming back to Holland in the spring…& we will be there! We were all in prog heaven by now…..& that was after two of the six acts!! Hosts Flamborough Head were forced to play a much shorter set as there were problems with the electrical supply. This gave everyone the chance to talk, eat & buy more cd’s. Nobody complained about the delay..we were all too busy having a great time! When they re-appeared Flamborough Head only had time for four numbers, but they still managed to prove why they were voted best new band in the Classic Rock Society poll last year. New material showed promise & the epic Garden of Dreams grows stronger every time I hear it….should be the highlight of the next cd. The Goldring twins came back for an acoustic set & were very popular with the audience. Chatting with them earlier, they are certainly real characters! Here they proved that they are mighty fine guitarists & they should be touring soon with a full band. These elder statesmen of prog have an interesting story to tell about their early days. New to the UK neo-prog scene are Janison Edge…maybe not so new as the members also belong to seasoned bands such as Credo, Shadowland & Landmarq. Hence their sound should come as no real surprise to anyone who has heard these bands. However this band has the edge thanks to the fine vocals of Sue Element. Song writing & musicianship is very high in this new group, and more than two years was spent in completing their debut cd The Services of Mary Goode. Many of the tracks were played tonight & this was only their second gig. All elements of neo-prog were here along with more whimsical moments, making them a real prospect for the future. Finally Re-Genesis…say what you like about tribute bands, they are simply superb & have mastered the sound of Gabriel’s Genesis spot-on. New vocalist Tony Patterson is even more like Gabriel & can even play flute, an advantage over the departing Glyn. We will never see Genesis play this material & it’s a treat to hear this material once again…this time it was Tim’s turn to be moved to tears during Supper’s Ready!! So six top bands & Bed + Breakfast all for around £14!!!! Fuel & the Eurotunnel cost £34 each…what a wonderful weekend for £50! Again we have vowed to come over next year. This has become an annual date on our calendars & I thoroughly recommend this festival. There simply are no bad points to this event…even the six hour journey gives four prog friends time to talk & listen to music on the way up to Holland. This & last years event will always stay in my memory as happy occasions. I was sincerely touched by the weekend..amazing!! Memories of my Dutch breakfast will last longer as I came back armed with a whole Edam & a box of Hagelslag!! Keith Marshall’s review on the Eleusis Website. If you’ve read my review of last year’s ProgFarm festival you’ll know that I had a thoroughly enjoyable time, so it’s no surprise that I went back again for this year. If you don’t already know, ProgFarm is a small festival organised by the Dutch band Flamborough Head on a farm somewhere in the north of the Netherlands. This year there were six bands in all, and the show quickly sold out (around 170 tickets). Although not very big, ProgFarm manages to create a superb atmosphere. The bands and several of the attendees stay overnight in a converted barn, so there are many chances to meet and talk to people outside of the main venue – over breakfast for example! Last year Mike Eldon drove myself, Frank Blades of Alternate View and Tim “don’t mention the Chicken song!” Burness, and we all swore to return the following year. Frank couldn’t make it this year, but we replaced him with a friend of mine (Steve) and arranged things a little better, travelling down on the Friday rather than overnight so that we might actually be awake when the bands were playing. This also had the advantage that we could choose where we slept, and having been half frozen to death last year we opted for the beds nearest the heaters. As it turned out it was nowhere near as cold as last year, preferring to rain buckets instead, but I was still glad of the heat in the morning. Native Dutch instrumentalists Lady Lake opened the show after lunch, and although not as stunning as Sinister Street last year they were good enough to get the crowd going. The band play as a three-piece (guitar, keyboards and drums with the keyboardist handling the bass lines), and come across better than some of the instrumental bands I’ve heard, although I still think that this kind of music needs the kind of focus that a singer provides. Still, they don’t over-use repetitive sections and their music flows around through various time signatures and chord changes to provide a pleasant enough hour. The band’s name comes from an album by 70’s band Gnidrolog, and since the two brothers from this band were there they joined them for a stirring rendition of their best-known track I Could Never be a Soldier to finish the set. This s a powerful anti-war song with a great instrumental section towards the end and went down extremely well with the crowd. I’ll say some more about Gnidrolog later..
As soon as we saw the line-up Mike and I had been excitedly waiting for this set. Sinkadus are one of the Swedish progressive bands who for me have been revolutionising progressive music in the last few years. Playing as a five piece (flute/vocals, bass/vocals, guitar, keyboards, drums) they produce some truly brilliant music; dark, atmospheric, atonal, moody in places. Their two albums Aurum Nostrum and Cirkus are both released by Cyclops Records, and are arguably two of the best CDs on the label. I was initially surprised to find them so low down in the running order as I had half expected them to be headlining, but having spoken to Edo (Spanninga, from the organisers Flamborough Head) he was worried that some of the crowd might find them a little too experimental and he didn’t want to kill off the atmosphere later in the evening. Still, as it turned out they were one of the few bands to play a full setlist so it all worked out well in the end. After a rather shaky opening track from the second album, Sinkadus got into their stride properly with the closing track from their first album, and never looked back. All the material they played came from the two albums, so I knew the music which I think is an advantage with such a complex style. It was all played flawlessly, resulting in an excellent set. The bass player’s male vocals, sung in Swedish, offer an excellent accompaniment to the dark nature of their sound, although I noticed that the female flautist actually sang more of the lines on stage than on the album, which was fine since she also has a good voice. The best sections of course are where they both sing in harmony. I think a few of the crowd didn’t like the style, but it was still fairly full in the venue towards the end of the set when we noticed that the lights had gone out in the sales area just outside, warning of what was about to occur. Still, Sinkadus were cheered on enough for an encore, particularly by the mad Belgian contingent (who were equally mad about Twin Age last year!) to everyone’s satisfaction. As the set finished we had a message in Dutch from the stage which I presume was warning us about the lights, and on walking out of the main stage area we found the CD stalls and stands in pitch darkness since the lights had gone. Initially I assumed that some rain water had got into the electrics since it had been chucking it down most of the day and some of the canvas roofing had been leaking earlier, but it was soon back on again. I wasn’t really looking forward to this set since I found the band a little boring last year – I also have to be careful when reviewing them since of course they did organise the whole event and they are all really nice people (hi Edo and Marcel!). However, they started with a nice instrumental track which made me think that I had perhaps misjudged them a little. Unfortunately disaster struck during the first song, and the failing electrics finally gave in, knocking out the on-stage lighting amongst other things (although not the sound system, thankfully!). The band had to hurry off stage to sort things out, and we spent an hour or so in darkness before a helpful electrician in the audience manage to jury-rig a temporary fuse. Amazingly the audience just waited patiently for things to be fixed, unlike if this had happened at a gig in London when bottles would have been thrown and worse.. Eventually the band came back on, but only had time to play a couple of pieces including one quite long, new track which sounded pretty good to me. By cutting their set short they left enough time for the other bands to get a fair set, which was pretty generous given that it was their festival. I guess at any progressive rock festival you are bound to find a few interesting characters, but the twin brothers behind this band are almost larger than life. If you’ve ever seen the television program Absolutely Fabulous you might get some idea of the hippy aura they gave off… “Oh yeah, Crimso were there at that festival we played at in ’72, yeah man..” Don’t get me wrong, they were nice guys, and I guess that if anyone has the right to be old hippies they’ve probably earned it, but it could get a bit wearing after a while! Anyhow, we’d already seen these two diminutive, white-haired men on stage with Lady Lake earlier, and spoken to them a fair bit earlier during the day when they were playing an acoustic set in the “ProgCafe” (a converted farm building with tables and chairs used for mealtimes), although we weren’t sure what to expect when they finally went on stage about an hour later than scheduled, after some confusion as to whether they or Janison Edge should be on next. What we got was an acoustic set lasting about twenty minutes, starting with a few “normal” songs but also including an extremely silly (but poignant in a way) hippy anti-violence song, and closing with a Jewish chant! The crowd in general seemed to love it, and the brothers were obviously enjoying themselves, although I’m not entirely sure what was progressive about it all, but there you go. I think perhaps we needed something a bit different after the fiasco with the electrics anyway, and this got everyone back into the mood again perfectly. I was getting a little worried that this English band might not be able to carry off such a late slot in the order, after hearing a rumour that this was only their second gig ever. As it happens, most of the band members have been around a bit in other bands – Shadowlands, Credo and Landmarq to mention three, so they’re a bit of a neo-prog supergroup. Then again, the Credo link didn’t inspire me much either, I have to say since I really can’t stand that band. As it turned out the band offer a refreshing slant on the neo-progressive theme, with a female singer (Sue Element), who co-wrote their album alongside keyboard player Mike Varty. The other members complete a standard 5-piece line-up with guitar, bass and drums, and their music, although nothing new or special, was certainly quite well performed and went down well. THey played several of the tracks off their album The Services of Mary Goode and probably would have performed all of them if they hadn’t had to cut short their set by a few minutes due to the earlier delays. As with No Name who filled the penultimate slot last year, they have some good tunes and hook-lines, with some nice progressive sections here and there, particularly the opening song A Twist in the Tale of Earth History which has an explosive beginning. The set was quite enjoyable, and I even went and bought their CD, but it wasn’t mind-blowing in any way, and some of the quieter songs didn’t do much for me, such as the ballad Julie Lies, although Mike seemed to like this so I guess it was just my lack of sentimentality..! I generally don’t approve of cover bands, since I prefer to see the original, but in the case of early Genesis I don’t have that option, and ReGenesis are almost as good if not better. From the opening chords of Watcher of the Skies, through Firth of Fifth, The Musical Box, Supper’s Ready and most of the first side of The Lamb Lies Down on Broadway to a rousing Los Endos they played all the best stuff, and so well you really couldn’t tell the difference. They have a new singer since I saw them last, and he is even more like Peter Gabriel than the last one, even down to playing the flute on some tracks, not to mention all the masks and stage stories. The drummer also excels, even down to playing a few bits of guitar when necessary, and singing backing vocals just as Phil Collins used to. If you like early Genesis, and like me were never old enough to see them at their true peak, ReGenesis offer an almost perfect experience and come highly recommended. This band are now bigger than most of the original progressive rock bands who play in England, having sold out some reasonably big venues around the UK over the last year. They rounded off a ProgFarm which was certainly more consistent than last year’s, but perhaps lacked the real high everyone got from Twin Age. Still, I thoroughly enjoyed myself again, and will be going next year. Edo hasn’t committed to anything yet but he already has a queue of bands wanting to perform, so I suspect and hope it will happen. If you want to help out I think Edo still has some T-shirts left – maybe buying one will help provide the cash for next year..
As before I must thank Mike for the superhuman effort of driving 450 miles each way in a single weekend, Edo and Flamborough Head for organising such a great gig, and everyone else I met or talked to for creating a wonderful atmosphere, even the mad Belgians! Simon Hill’s review on the New Horizons Website. The venue for ProgFarm actually is a farm – now run as an activity centre for school parties, rather than being an agricultural concern – owned by Koen Roozen, drummer of Flamborough Head. It is situated near the village of Bakkeveen in the north eastern corner of Holland, and this was the third successive year the festival has been held. Facilities are fairly basic, but more than adequate with dormitories, shower and canteen facilties all laid on for visitors and, thankfully, the bands all play indoors in a converted barn. The event is a fairly small affair with ticket sales limited to around 150, but this makes for a really friendly atmosphere – crowded but not claustrophobic. All the tickets had been sold well before the event took place, most of the audience being native to Holland but people from Belgium, Germany and a few from England were also present. Although I had been aware of the event, I had never really given serious consideration to going along simply due to the logistics of planning such a trip. I was delighted, therefore, when Janison Edge (who we interviewed at the Whitchurch Festival earlier this year) very kindly offered to take me along in return for my helping out with some of the driving … my thanks go to all of the band for the great friendship and hospitality that they showed to me throughout the weekend. Chief organiser for the festival Edo Spanninga – keyboard player with Flamborough Head – showed us around and made us all feel very welcome when we finally arrived on friday night. After going out for food we returned to the Prog Cafe on site, and sat around chatting to some of the other musicians, drinking beer and generally having a good time until the early hours when fatigue got the better of me, and I finally retired to the dormitory for a comfortable nights sleep. The music itself was due to kick off at 3pm on Saturday afternoon and each band was allocated a slot of 1hr 15 minutes, with a half hour turnaround between acts. Things started off running to schedule and first band to take the stage were Lady Lake. Lady Lake are a Dutch band who took their name from the second Gnidrolog album and they have been around since the 70’s. They are a three piece outfit, made up of guitarist, keyboard player and drummer who play very fluid instrumental pieces with real emotional flavour. The music has a very European style and my initial impression was that it was was comparable, in its approach, to that of Focus. Talking to the keyboard player afterwards I discovered that a conscious effort had been made to emulate them. I found the music to be instantly likeable with a good balance between guitar and keyboards. The sound is very melodic and manages to take a symphonic approach without ever falling into the trap of going too over board. Material was, for the most part (I believe), taken from the band’s only album ‘No Pictures’, although at least two of the songs, ‘Ford Theatre’ and ‘Do the Dubbe’, were new numbers. Particularly memorable songs that stuck in with me afterwards were ‘Magic Twanger’ and ‘Must Have Been’. The highlight of the set was when the Goldring twins joined Lady Lake on stage to perform the Gnidrolog song ‘I Could Never Be a Soldier’. This was the first time that the song had been performed by a full band for some 27 years – and the result was a piece of pure magic. Although all the musicians performed impecabbly, special mention must be made of Colin Goldring’s amazing recorder playing during this song which made a very powerful impact. The entire performance was very smooth and gave no clues to the fact that Lady Lake and Gnidrolog had only had a brief period the night before to rehearse the piece, never having played together before! The obvious enjoyment of all five musicians was infectious with emotions running very high. I have to say the resulting applause was well deserved. Next up were Swedish band Sinkadus a band that, I must admit, I had never listened to previously. But after this performance I had the distinct feeling that I had been missing out on a very talented band. Sinkadus are a five piece band who perform all their material in Swedish, and although this meant I did not know what any of the songs were about, I actually found it quite refreshing to see a band who did not feel that they had to perform in English. Sinkadus make very effective use of two vocalists – which sets up some interesting contrasts as Rickard Bistrom (bass) and Linda Johansson (Flute) alternately take the lead part. Much of the music is quite complex, with very long songs full of tempo changes and shifts in direction, but by the end of the second track, ‘Agren’, I found myself quite taken with them. Keyboard work ranged from very heavy moody passages to light flowing pieces and the flute parts really lent a sense of atmosphere to the music. After the gig I secured a copy of the bands first CD ‘Aurum Nostrum’ on the strength of the track ‘Agren’, and I will be reviewing this album soon. I must also make mention of a contingent in the audience who had travelled up from Belgium. They showed their obvious delight throughout the band’s set by singing and dancing along with all the songs … I must say it’s great to see people clearly having such fun. Right at the end of the previous set, the main lights in the venue went off – leaving only the stage lights working for a while. It transpired that an electrical generator had failed and electricians were battling gallantly to sort things out. Eventually the problems were resolved and, with the stage lights working again, Flamborough Head returned to the stage to perform a further three numbers. Despite everything that had happened they really gave it the works. Although the set was disappointingly brief, it was very well executed with flourishing keyboard work in the finest symphonic prog tradition backed by powerful guitar work and driving percussion. The final song in the set was particularly strong, with intense vocals delivered in a fashion reminiscent of Martin Wilson (Grey Lady Down). I hope that there will be an opportunity to see Flamborough Head perform a full set at some time in the not too distant future as they really come across well as a live band. Gnidrolog go back to the early days of progressive music. Back in the years 1969-1973 they made something of a name for themselves. Now, I have to confess that until the Whitchurch Festival earlier this year I had never actually heard of them, and even at Whitchurch I only saw them perform a soundcheck of the song ‘Give Us Peace’ (I missed their set due to interview commitments). 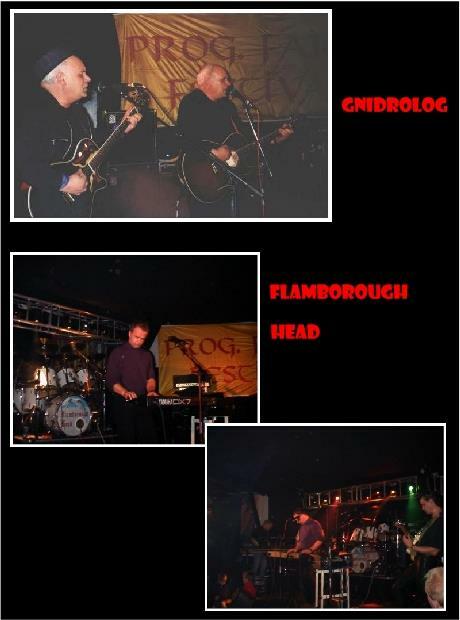 The set they played at progfarm was a purely acoustic one, perfomed by identical twins Stewart and Colin Goldring, the band’s founder members. Due to the constriants of playing acoustic numbers, the intention was to play a very limited set lasting about 25 minutes. The result was absoutely stunning and for me they really stole the entire show. The set went down very well and the brother’s obvious talents as real showmen captivated the audience. There was humour thoroughout, not only in terms of the musical content – as witnessed in the performance of the classic ‘My Mother’ – but also with the banter that linked the tracks together. When they performed ‘Give Us Peace’ the majority of the audience was more than happy to become involved and sing along with the chorus. As an encore, the brothers came back to the stage to perform a vocal duet in the form of a Jewish passover song, the title of which I am afraid I did not catch. All in all this was a superlative performance and I was so impressed by the performance that I became determined to catch the band at the next opportunity (which as it happened was 13th November – a review of which will follow shortly!). At the begining there were problems with the sound balance – which were outside the band’s control as they were in the hands of the contract sound engineers. Initially the vocals were too quiet, the keyboards too loud and the fact that the band members did not have proper monitors made things harder for them. However by the end of the first number the majority of these problems seemed to be behind them and they put on a magnificent show for only their second ever performance as a full band. From the outset it was obvious to me that Sue Element’s vocal talents extended well beyond her studio performance, she really shone throughout the set. Mike Varty also put in a masterly show at the keyboards, I was very impressed with his playing both in the band’s own songs and also in a brief classical improvisation that fell between numbers – which Sue subsequently referred to as “Mr Ludwig Van Varty on piano!”. Highspot of the show was the brilliant ‘Beneath the Boy’. Since first hearing the CD, ‘The Services of Mary Goode’ (see our CD reviews page), this has been my favourite Janison Edge track and Sue performed it with real feeling. Mention should also be made of Ian Salmon’s guitar work on this track in particular. It was played with skill and conviction and he looked as if he were really lost in the music. Breathtaking stuff! Solid performances also came from Dave Wagstaffe on drums and Paul Brown on bass. A minor technical problem occured towards the end of the set when the keyboards died withought warning, but Ian jumped in with a quick verse of theme music from the excellent children’s TV show ‘Huxley Pig’ which made for a moment of humour – which was, perhaps, lost on many of the audience. One very minor point of criticsm, if any be made, is that there were a few uneasy gaps between songs that perhaps could have been filled with a little more interaction with the audience. But since this was only the band’s second ever show, I think allowance can be made for that – this is, after all, something that will develop naturally with time. This is another band I am really looking forward to seeing again! For some reason I feel a little uneasy at the idea of covers bands, but I find it hard to explain exactly why. For the many people who enjoy Genesis’ music and never had the chance to hear it performed live, the idea is a good one and the band were received well by an appreciative audience. The singer did a good job with the costume changes and made a convincing perfomance of the show but, sadly, I cannot say as much about the rest of the band. Although they played brilliantly the performance was a somewhat lack lustre one, and the bass player in particular looked as if he would have preferred to be somewhere else. In the end, I am sorry to say, I went out of the hall to peruse the CD’s on sale, preferring to listen to the band playing without actually watching them. Although I may be in a minority in my opinion of re-Genesis, I spoke to quite a few people afterwards who expressed the same concerns. I guess you cannot please everyone all the time! Progfarm really was a great weekend and I sincerely hope that this will continue to take place as a regular annual event. A lot of hard work was put in by the organisers, and from the audience’s point of view it was effort really well spent. The musicians also went out of their way to talk to the fans and the tone of the whole event was very cordial. Another benefit of this type of event is that it provides a great platform for people from many different countries to get together and forge new friendships while following a common goal. If next year’s event does take place, make sure to book early to avoid disappointment. If you have been to progfarm before you will know what to expect, if you have not been along I can strongly recommend the experience! At first I’d like to thank the organizers of this festival, the dutch band FLAMBOROUGH HEAD, for the great time we had among all those progmaniacs in that cosy atmosphere. Although it rained throughout the entire Saturday and the nights were cold it again was a very nice time with lots of nice people, good musicians and good catering. Congratulations to the hard working kitchen staff … they really gave all they had to give to provide fans and bands with Nasi, Chili, great Hamburgers, Frikadels and drinks. The first band, LADY LAKE (NL) entered the stage at 15:00 o’clock in the afternoon. The history of this band reaches back far into the 70ies. The name of the band is taken from the album title of second album of the british 70ies prog legend GNIDROLOG. In 1982 the band decided to stop playing in the public because of the declination of prog and thinking, that nobody wants to hear this kind of music anymore. After the french label MUSEA had contacted them in 1995 for a re-release of their Album “No pictures”, the band came back to strength and back into the public, as they made a gig in early 1998 (25th anniversary of the band) together with the Goldring twins of GNIDROLOG. LADY LAKE played for about one hour and during a very few parts it seemed that they still have not enough life experience, but it did not matter at all. These three nice guys performed their Gentle Giant / Focus / Camel / Gryphon – influenced instrumental progrock in an astonishing and exciting way. Compact songs without useless breaks, sensitive guitar-melodies, developing structures and effectful blues/jazzrock influences. The highlights of their perfomance: 48 cm and the great new song Ford theatre. It’s great that this band is on the streets again ! After a very short break the two GOLDRING twins (STEWART AND COLLIN GOLDRING) of the 70ies cult progband GNIDROLOG entered the stage (electric guitar & acoustic guitar). These two very sympathic and experienced brothers were the special highlight of the PROGFARM 99. As you might know, they founded GNIDROLOG in 1969 (!!!). In the early 70ies this band released two milestone albums for prog music. Their experience reaches from classical musicianship to producing albums, playing prog in the early 70ies, touring with Yes, Santana, Jimmy Hendrix, Gentle Giant and so on. Even present reviews state, that GNIDROLOG’s music has been “ahead of it’s time” in the early 70ies. Because of RCA’s decision (in 1999) to rerelease the GNIDROLOG albums, the GOLDRING brothers decided to return to making progressive albums again and here they were … 24 years after their last GNIDROLOG-gig in Europe. Supported by LADY LAKE on keyboards, keyboard-bass, drums and e-guitar the GOLDRING Stewart and Collin performed the GNIDROLOG classic “I could never be a soldjer”, one of the most essential anti-war songs (“dedicated” to the Vietnam war) of the hippie-period. I can’t desribe that lucky and satisfying feeling to see these two brothers on stage … the entire room could feel their dedication and joy to play in front again and as the song was over loud, respectful and deeply honest applause forced the two brothers to nearly fall into tears as they lay in their arms and left the stage so that even some of the fans had more water in the eyes as usual (including me). SINKADUS (SWE) were next. It was my first contact with the music of this band and I have to admit that it was not catchy enough for writing a review on it after hearing it the first time. But I’ll try anyway. SINKADUS play freakin’ progrock on a high technical level … no neoprog clichees … just pure freakin’ progrock, carried especially by the flute. SINKADUS opened with the instrumental Positivhalaren that sent shivers down the spine of the crowd by Gentle Giant flair combined with warm flute, great bass-lines and fascinating prog-grooves. One of the highlights was Jag.Änglmarks bane, a varied song with freakin parts, dark athmosphere, warm and melodic parts that let the audience dream from beautiful fjords, dramatic elements with hammering bass … superb stuff … as was the weird instrumental Valkyria. An very, very interesting performance. I really wish that SINKADUS get more pupularity over here … they deserve it because of their freakin’ and damn dramatic progrock somwhere between GENESIS, SPOCK’S BEARD, GENTLE GIANT and dark and a stunning horrifying atmosphere that always is able to pull the listener back into safe waters with sensitive parts dominated by beautiful flute melodies. Wow ! Now it was the hosts’ turn. FLAMBOROUGH HEAD started with the instrumental Legend of the old man’s tree which was followed by a long break because of a blown fuse. The light’s fell out, a few times all people stood in complete darkness but not a single fans got annoyed. There was enough to talk about with other fans. In order to stay in the timeframe, FLAMBOROUGH HEADS cut down their program down to size and played a new song called “House of cards”. “Garden of dreams” (played on ProgFarm 1998 already) was played in an enhanced version (at least that’s what I think). What can I say ? The songwriting of FLAMBOROUGH HEAD have got more experimental, more daring, smashing some real heavy and freakin’ influences into the crowd. The gig was definetily too short (but it’s a great gesture to cut down the own program on the own festival to stay in time) but the great new songs showed, that the upcoming FH-album is able to become a prog-highlight of next year. Now it was time again for the GOLDRING twins to enter the stage and lighten the hearts again – now unplugged … equiped with two accoustic guitars. With Thank you Martin McCarthy, Promised land, Wonder, wonder, the sarcasm-overloaded humourous My mother gave me a gun, Give us peace and an hebrew title [yeah Stewart, you were right, I can’t write this … ] the GOLDRINGs played theirselfes into the hearts of the audience. This is what rock music is all about. Dedication, music, joy, expression and entertainment. Great musicianship, classical guitar skills and charisma do not need amplifiers, keyboards, bass or drums … it that’s what these two musicians demonstrated to all the friends in music gathered around the stage. I think for all people it was a great pleasure and experience to meet you, Stewart and Collin and to listen to your performance ! The real headliner of the evening was JANISON EDGE (UK). I don’t know why so many german proggers always complain about neoprog-clichees … I really don’t care. It’s the music and the feeling that counts, no matter who invented certain styles and atmospheres. JANISON EDGE play beautiful, highly melodic progrock … this is big music with floating keyboards, bombast, tight songwriting, spine-tingling keyboard-solos and warm female vocals. They opened with Twist in the tale of earth history which could not quite grab my soul, but after The Birth of Mary Goode, Oldman, The services of Mary Goode (I don’t care if it sounds like Nolan) the souls of all people in the audience were set on fire – burning until JANISON EDGE left the stage. A great band that deservers wider exposure ! Perhaps a gig exchange with german bands like AMON RA or ESTHETIC PALE could help here. At 10 minutes past midnight the Genesis cover-band RE-GENESIS started their performance with Watcher of the skies. I have to admit that I am not a great fan of Genesis cover bands, as the german band SECOND’S OUT really pulled my finger during a real bad gig last summer. RE-GENESIS fulfilled their “mission” very good. I have never heard a Genesis-coverband to be that close to the original songs (the vocals were not quite sounding like Gabriel but who cares). With the help of some customes the singer brought a touch of the original stage to Bakkeveen, trying the best to let the crowd boil … but somehow it did not happen … might be it was too late. But as Supper’s Ready was played (at 1:10 a.m.) the athmosphere was heating up again. RE-GENESIS really played the big ones without any problems. Great work ! Stewart Elliott Goldring’s (Gnidrolog) review on the Gnidrolog Website. Colin and I had a great time at Progfarm this weekend and we seemed to be well received. Everyone made us extremely welcome in Holland and special thanks go to Fred and ‘Lady Lake’ and Edo and the guys from ‘Flamborough Head.’ There was an extremely supportive atmosphere there and everybody worked hard to make the event go smoothly. I was especially impressed with the lack of histrionics and competitiveness usually to be found amongst musicians. The Dutch especially have a relaxed and laid back way of including everybody, and the beer is terrific! Sadly, the weather and food were not quite up to the standard of the playing but you can’t have everything! I’ll let others review our performances but I thought I might say something about the other bands. In general, I haven’t heard much of neo-prog music, being steeped from a previous age, so it was interesting to compare these newer bands with music and bands I know from the 1970s. LADY LAKE were on first and we joined them at the end of their set for a rendition of ‘I Could Never be a Soldier.’ They are a 3 piece, guitar, keyboards / bass pedals and drums. They play a brand of Dutch progressive rock music that is extremely musical and melodic. I especially like the way they use long chord sequences and they have an extremely mature approach to their musicianship. Fred Rosenkamp uses the guitar and outboard to create a broad sound vista and exploits his superb skills in playing and composition to create an interesting performance. They have toughened their presentation and play with a somewhat harder edge than when we saw them last year.I am looking forward to a follow up album from their excellent ‘No Pictures’ album, let’s hope it won’t be long until they are in the studio again. I am reliably informed that bands like SINKADUS from Sweden often dress up as elves so I shouldn’t have been surprised at the costumes! I thought also that they were extremely brave to sing entirely in Swedish! They won’t mind me saying that their music seem heavily influenced by expressionist music and there are some interesting harmonic and melodic references to Berg and Schonberg. Excellent musicians, they had consummate control over pieces that were obviously difficult to play and even more challenging to listen to. Constantly shifting key and time signatures their music seemed restless and unresolved, more arrangement that melody. However, I was at a disadvantage in not understanding what the ‘songs’ were about, unlike the audience who obviously keyed in to the performance attentively and enthusiastically. We saw FLAMBOROUGH HEAD perform at Deventer and they are an accomplished symphonic, progressive rock band, concentrating their performances around excellent arrangements and fine songs. Of all the bands at Progfarm, they demonstrated finely honed skills in playing together and they were tight and well rehearsed. They are an excellent example of good individual musicians that work even better collectively, and are certainly as accomplished as many better known and established groups in the genre. Even though this was only the second band gig for JANISON EDGE you wouldn’t have known it. Here’s a real little corker of a band in the English progrock tradition featuring some fine expressive vocals and excellent musicianship. I must say here that one of the features of all the musicians at Progfarm was the very high level of playing skills presented. Put Colin and me in our place really as ‘accuracy’ wasn’t always a strong point for us or indeed our contemporaries! We were more interested in the effect of taking musical risks and chances and weren’t concerned with making ‘mistakes’ if the emotional context of the music was realised. I’ll need to check their music out and take a listen again to their album but there is certainly a lot to listen to and it’s all brilliantly done. I’m not quite sure what to say about REGENESIS. If you like Genesis, you’ll like this. They do say that the sincerest form of flattery is imitation and that is what you have here. The difference is of course, that even if you have heard the records it’s always more fun to see it in action. These guys can sure play! When bands seek to recreate good music as they do they are following in the footsteps of classical music. I guess that Genesis music must be the classical music of today so they are well worth a visit for fans of Genesis. What next I wonder? There are already cover bands for Yes and Pink Floyd, so you’ll know that you have arrived when there is a cover band playing your music somewhere. A great weekend was had by all and it got me to thinking about why there is no similar event in this country [ the U.K.] on a more regular basis especially in London where we invented it! So come on promoters, how about some festivals around here? Ralf Koch’s review in the Empire Magazine Nov. ´99. betraf) trugen bei zu der familiären Atmosphäre, die den besonderen Reiz dieses kleinen Festival (die 160 Karten waren viel zu schnell ausverkauft) ausmachte. Dazu noch ein brillianter Sound, nicht zu laut, eine gute Lichtanlage und sechs Bands, die ein abwechslungsreiches Programm versprachen, da konnte eigentlich nichts mehr schiefgehen. Um 15:00 ging´s los mit den Holländern von Lady Lake – unterstützt von den Gebrüdern Goldring von Gnidrolog (so fällt einem direkt auf, wie auch die beiden auf ihren Bandnamen gekommen sind…). Ein einmaliges Ereignis, das übrigens daher rührt, dass Lady Lake widerum ihren Namen von einem Gnidrolog-Album haben. Ein schönes Durcheinander, welches den allerdings nicht ganz so konfusen, sondern eher melodischen Instrumentalprog von Lady Lake ergab. Wesentlich “progressiver” hatten´s dann schon die Schweden von Sinkadus – da das alles nur begrenzt mein Ding war, erspare ich mir Kommentare. Nach der zweiten Umbaupause begannen die Gastgeber, kamen allerdings nicht über ihr Intro hinaus: Kurzschluss. Eine einstündige Unterbrechung brachte den Zeitplan etwas durcheinander, was zur Folge hatte, dass der folgende Gig von Flamborough Head drastisch verkürzt wurde. Schade eigentlich, denn die drei Stücke, die schließlich zu hören waren, machten Lust auf mehr. Hopefully soon! Aber die Gastgeber traten extra zurück, damit die anderen ihren vollen Set spielen konnten, was nach dem erneuten, sehr unterhaltsamen und witzigen Auftreten der Goldring-Brüder vor allem Janison Edge und ReGenesis zugute kam. Jansion Edge konnten absolut überzeugen bei ihrem ersten “Full-Band”-Konzert auf dem Kontinent – vor allem Keyboarder Mike Varty und Gitarrist Ian-Flitzefinger-Salmon (unglaublich, was für spielerische Finessen die ganze Zeit im Hintergrund ablaufen können) machten den Gig zum Erlebnis. Ein Erlebnis ganz anderer Art, nämlich eine Zeitreise ins Jahr 1975 bescherten dann ReGenesis. Ihre absolut perfekte Kopie der Genesis-Show von damals – von jedem Ton über Hintergrundgeräusche bis hin zur Gestik des Sängers – sorgte bei den meisten Zuschauern für wohlige Schauer und ungläubiges Staunen. Einzelne Musiker hier herauszunehmen (mich hat vor allem der Drummer umgehauen!) wäre Quatsch – hier stimmte alles! Ein gigantisches Finale für ein Spitzenfestival, das garantiert mindestens die doppelte Kartenzahl locker hätte verkaufen können und die fünffache Menge an Zuschauern verdient gehabt hätte. Aber dann wäre es mit der netten Atmosphäre auch Essig gewesen, also bei nächsten Mal lieber fixer sein, it doesn´t get any better than this!